A Minnesota teen is safe after being rescued from a cave located north of Cresco, Iowa, not far from the Minnesota border. 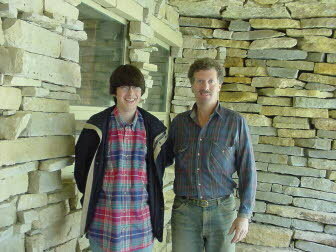 Andy Wernimont, 16, of Byron , MN was trapped in Skunk Cave for 12 hours before being rescued by Minnesota cave explorer John Ackerman. Andy entered the cave at 10 a.m. Saturday morning with his father and 2 friends, and after approximately one hour Andy became hopelessly wedged in a tight crevice. Soon thereafter a 911 call alerted authorities from Iowa and Minnesota, including caving organizations from both states. The Minnesota Dept. of Natural Resources, the Winona Rescue Unit, the Fillmore County Sheriff’s Office, the Winneshiek County Sheriff’s Office, the Decorah Fire Dept., the Howard and Winneshiek County Ambulance Services, along with other specialized individuals and groups converged on the scene. In addition, a helicopter from Mayo Air Ambulance landed near the cave. In spite of their best efforts, Andy was hopelessly wedged tight. The Minnesota DNR eventually assumed control of the in-cave rescue attempt, but in spite of their best efforts using an array of rescue equipment, including an industrial electric hammer drill and a hydraulic pump, the boy remained stuck. The cave temperature was 48 degrees, and Andy’s condition began to fail rapidly due to the onset of hyperthermia. Authorities had earlier attempted to contact John Ackerman, a cave explorer and owner of the Minnesota Cave Preserve, but Ackerman and friend David Gerboth were exploring a Minnesota cave and could not be located. Finally Saturday evening Ackerman and Gerboth received the urgent message and sped to the scene. Ackerman raced into the cave, carrying specialized rescue gear, including a battery operated hammer drill and small explosive charges. Within minutes of reaching the accident site Ackerman successfully pulled the boy free without resorting to rock removal.